ICAR AIEEA PG 2019 - The Indian Council of Agricultural Research ICAR AIEEA PG 2019. ICAR’s All India Entrance Exam for Admission to Master Degree Programmes has been released. The Indian Council of Agricultural Research (ICAR) has entrusted the responsibility of conducting All India Entrance Exams for admission to PG Courses in AUs, and award of scholarships and fellowships to the NTA from 2019 onwards. Students for 25% seats in accredited Master degree programmes in accredited colleges of accredited AUs’ are admitted through ICAR-AIEEA (PG). All (100%) seats of the four ICAR-DUs namely, Indian Agricultural Research Institute (IARI), Indian Veterinary Research Institute (IVRI), National Dairy Research Institute (NDRI) and Central Institute of Fisheries Education (CIFE) are also filled up through the same exam. The remaining admitted students will be awarded NTS (PGS). Master Degrees are awarded by Agricultural Universities in about 95 sub-subjects under 20 major subject groups (Annexure-III). Candidate should select one major subject-group among the following for appearing in the Entrance Exam, based on the compatibility with his/her own subject area at his/her graduation level. Candidate must ensure that he/she fulfills the eligibility requirements for the exam as well as admission as detailed in the Information Bulletin. 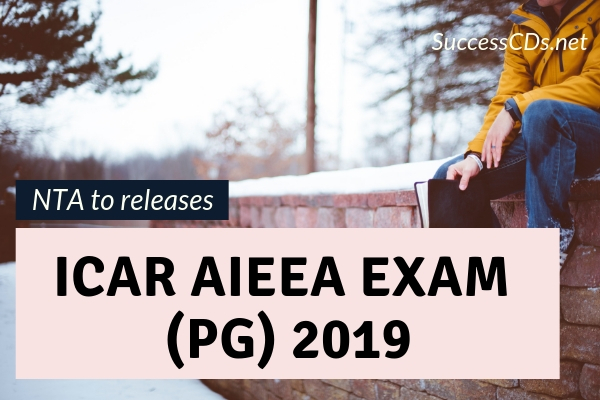 Applying for ICAR AIEEA (PG) 2019, appearing in the exam and qualifying the same does not necessarily mean acceptance of eligibility. The applicant for a particular Subject must satisfy the eligibility criterion as specified in this Information Bulletin (or its amendments / corrections). Filling of ICAR quota seats in PG programmes in Agricultural Universities through NTA Entrance Exam will not be allowed for non-accredited programmes, colleges and the Universities. The candidates with a Bachelor’s degree with 3 years’ duration will not be considered for admission through ICAR AIEEA (PG) 2019 in AUs under ICAR-AU system except in two ICAR DUs, viz. IARI, NDRI for which the eligibility criteria of the concerned ICAR-DU, including admission of graduates having passed with 3 years’ degree, would prevail for admission. The Candidate must have passed Bachelor degree exam securing Overall Grade Point Average (OGPA) of at least 6.60/10.00 in ten-point scale, 3.25/5.00 in five-point scale, 2.60/4.00 in four-point scale for General, OBC and UPS categories whereas for SC/ST/Person with Disability (PwD) candidates, the said requirement is an OGPA of at least 5.60/10.00, 2.75/5.00, 2.20/4.40, respectively. For admission in Master degree courses under ICAR-AU system, candidate must have four years Bachelor degree in Agriculture, Horticulture, Forestry, Fisheries Science, Home Science etc., after 10+2 or equivalent or 10+6 exam. Candidate should also note that for admission to Master’s degree programmes through entrance exam conducted by ICAR, only the candidates having passed graduation with four years’ degree programme from any recognized University will be eligible. Master degree in Agriculture/ Horticulture/Veterinary sciences but IARI Pusa and NDRI Karnal may admit three-years B.Sc. degree holders in certain subjects. Indian Nationals not below 19 years as on 31st August 2019 (i.e., candidate should not have been born after 01st September 2000) are eligible to appear in the exam. No relaxation is permissible regarding the minimum age limit. The Question Papers for the test shall be based on the Syllabus prescribed by the ICAR, is available at website www.icar.org.in or https://www.icar.org.in/content/syllabus-aieea-ug-aieea-pg-and-aicejrfsrfpgs-2019. A list of Exam City Centres is given in Annexure–I. NTA is the exam conducting body and its scope is limited to conducting the exam and providing the raw scores to ICAR. Candidates must note that all applicants shall be bound by the conditions as laid down in this Information Bulletin, and the rules and regulations as enshrined in the admitting University Act, Statutes, Ordinances, notifications and guidelines issued from time to time. Step 2: Upload scanned images of Candidate’s Photograph (between 10 kb – 200 kb) and Candidate’s Signature (between 4 kb – 30 kb) in JPG/JPEG format.